Ten days after our son was born, my wife was offered her dream job in Laos (and she accepted). Fortunately, the timeline had some flexibility and she was able to negotiate a September start date, meaning we’d be on the ground in Vientiane the day our son turned three months old. One thing that we couldn’t push off, however, was getting our baby boy—who had been on Planet Earth for less time than some of the leftovers in our fridge—a U.S. passport. True, we would not be setting foot outside of the U.S. for another few months, but Lori’s future employer had contracts and paperwork to process, and airline tickets to purchase, and our baby’s passport was a key component of all that. In essence, he couldn’t exist on paper until we got it done. Needless to say, we had quite a few logistics to work through in a very short period of time, giving us endless fun things to stress over, in addition to a lovely little newborn. In other words, we got 99 problems—but, fortunately for us—the passport ain’t one. And it shouldn’t be cause for stress for you either—even getting the dreaded passport photo for infant, which we’ll get to soon enough. Skip to the tips or read on for a bit of background. This article applies to U.S. citizens in the U.S. Unlike parenting (where, let’s face it, we parents fumble our way through most of it), I can actually speak authoritatively on this subject, given my intimate knowledge of the topic (more on that below). With that said, laws and regulations do change from time to time, so proceed accordingly. Don’t apply until you visit travel.state.gov and read the current instructions thoroughly. 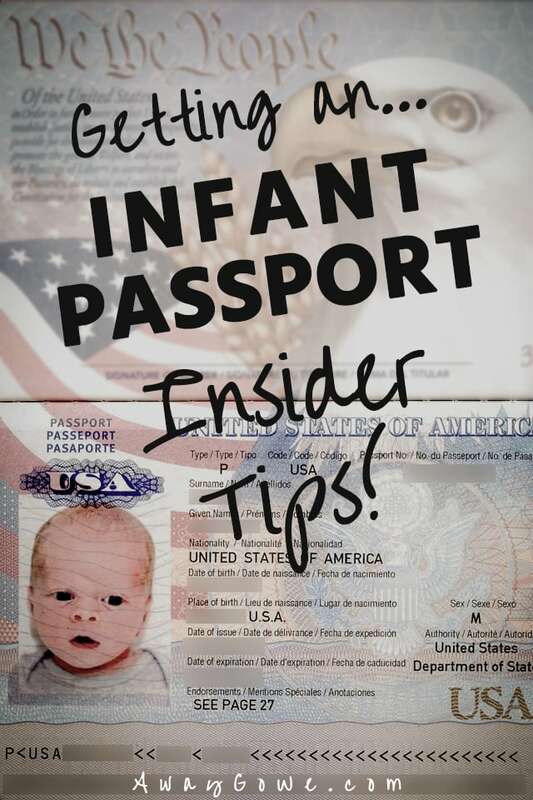 Back in a previous life nearly a decade ago, a sizable part of my job working for the Bureau of Consular Affairs was adjudicating passports—and newborns were no exception! Some days, I’d give a talk at a swearing-in ceremony for newly naturalized U.S. citizens one day, then see one of these brand new citizens the next day at the public counter with a tiny little son or daughter, who—unbeknownst to the little bundle of joy and poo—had also acquired citizenship the very moment their parent(s) did. It’s the culmination of a grueling journey (made even MORE grueling in recent years, but we’ll leave that there for now…) that often takes well over a decade, requiring continuous physical presence for a specific duration, among other things. It may seem counter-intuitive to a lot of people, but the first thing many of these folks want to do after getting their citizenship is LEAVE. And YOU might too!!! It’s not that they don’t love their newly-adoptive country any less. Rather, it marks the first time they can leave (and return) freely without fear of affecting physical presence or being denied reentry due to changes in laws, policies, etc. Add a newborn to the mix, and it’s even more cut and dry. And then there’s people like us, who for some inexplicable reason think it’s a good idea to take a newborn to Southeast Asia (and for the record, in retrospect, I can honestly say it WASN’T a good idea. It was a GREAT idea!). Do infants need a passport to travel abroad? YES! In some cases, you may be able to get away with a passport card or enhanced driver license (driving to Canada and Mexico), but for the vast majority of overseas trips, baby, just like the rest of us, will need to have a passport. Getting a passport for anyone of any age generally starts with a birth certificate. Now, it’s important to note I’m going to stick to the most common scenario here. There are a number of cases in which a birth certificate isn’t going to be what you need. But in the interest of keeping things simple, I’m going to assume baby was born in one of the fifty states and was issued a birth certificate from one of those states. Getting your hands on baby’s birth certificate is different for every state, but regardless of the procedure, the certificate you submit with baby’s passport application will need to be a certified copy of the birth certificate (NOT the hospital keepsake certificate and not a notarized copy or photocopy) listing both parents (again, we’re just dealing with the most typical scenario here). From experience, I’d recommend ordering multiple certified copies of the birth certificate from the registrars office at the time of birth (most hospitals incorporate this paperwork into their routine paperwork). If you plan on traveling or moving overseas fairly soon, I recommend requesting at least three certified copies. Generally speaking, for first-timers (as your newborn likely will be), this happens at an acceptance facility in your town (typically a post office). While there are ways around it (involving notarized paperwork, etc. ), it’s easiest for BOTH parents (whoever’s listed on the birth certificate) to go in with baby. You’ll need to make your appointment online via travel.state.gov. Passport processing typically takes 4-6 weeks, so if you are traveling before then, you’ll likely need to pay the expedite fee and likely want to pay for overnight return service. The agent at the acceptance facility will be able to steer you in the right direction, provided you have your flight itinerary with you. In rare cases, you can qualify for an appointment at a regional Passport Agency, but you’ll need to provide proof of imminent travel to get an appointment. Here it is, getting that elusive passport photo for infant. Do this step ASAP, and don’t take any chances with the quality, particularly if your travel plans are imminent. We took our own photo (as I do with all our passport photos), but I do not recommend the average parent trying this unless a) you are very confident with a camera, desktop imaging and high-quality printing; AND, b) you know EXACTLY what you are doing and what the requirements are. The most common reason for an application to get rejected is because of the passport photo. I saw this happen hundreds, if not thousands, of times. Keep in mind that just because the acceptance agent at the post office gives the thumbs up doesn’t 100% mean the photo won’t be rejected, and getting a photo rejected later in the process can hold up the application for weeks. That’s why it’s so important to get your photos done at a trusty outfit. FedEx Office generally does a pretty good job (I am in no way affiliated with FedEx Office, just my experience). Drug stores, not so much. With that said, if you are absolutely confident in what you are doing (and are following the requirements on the State Department’s website to the letter), you can stand to save a good chunk of change by doing the photo yourself, particularly if multiple people in your family are getting passports or you need several copies for visas, etc. Step Three (b) — But How the %$@# Do You Take a Passport Photo of a Newborn??? Ha. Well, as you may have figured, there’s no surefire way for getting a perfect passport photo of an infant, particularly a newborn. But here are a few helpful tips. Perhaps the most helpful tip I can offer is, that unless baby’s old enough to hold his head (and upper body) up all by himself, you’ll want to be taking the shot with baby laying on his back on a clean, pattern-free white surface (we used an ironed white sheet, which worked very well). But even that will only get you so far. One of you will still have to do everything in your power to get baby to look in the general direction of the camera. If you’ve ever spent time with a newborn, you know that this is next to impossible. Out of a half dozen shots, we got lucky. Instead of using baby’s favorite toy to get his attention, try some new, shiny object he’s never seen before. A quacker or kazoo also works great, though you want to be careful that baby doesn’t loose his sh*t, or it might be very hard to get a clear shot. And as tempting as it may be, remember no sunglasses, hats, or fake mustaches (real ones are okay, but you may have trouble explaining that one). Keep in mind, passports for children under 16 (including newborns) are good for five years. While you’ll want an infant passport photo you can stomach seeing every time you go through immigration, don’t worry too much about the likeness. In a couple of years, baby will look totally different! Up until age 16, immigration officials rely on an array of factors to positively identify a minor child, not solely relying on the passport photo (though if your five-year-old happens to have a babyface, it certainly won’t hurt matters). Lastly, do your best to get a good, clear likeness of your little one, but also keep in mind that the State Department does not expect newborn passport photos to be absolutely perfect. An experienced passport photographer should be able to help you make a good determination as to whether the photo will pass muster or not. Step Four — Complete the DS-11 Application for a U.S. Passport online and print it out. Complete the app as thoroughly (and truthfully) as possible. For “Occupation” it’s fine to write “Baby” or “Infant.” A good rule of thumb is not to leave any blanks. If a box truly doesn’t apply (like “Maiden name/ other names used”) simply write “N/A.” If you’ve got imminent travel plans, makes sure that’s reflected in the travel plans section. Bring your application form, passport photo, certified copy of birth certificate, passport fee(s), flight itinerary (if you are traveling soon), and any other supporting documents (for special cases, you know who you are) to your appointment. AND DON’T FORGET THE BABY! Most routine applicants can expect to receive their passport in the mail in about 4-6 weeks after application. Remember to sign the passport when you receive it (for a minor, you can sign the full name of the child and write “by mom” or “by dad” or guardian next to the signature. Make a high-resolution scan (and color photocopies) of the passport and store it in a safe place. In closing, I’d like to emphasize that this is only intended as an overview or cheatsheet, to demonstrate how easy the process is for most applicants to apply for a newborn passport. In addition to this overview, you will most certainly want to thoroughly read the official instructions at travel.state.gov. If you have questions regarding the process, it’s best to ask the acceptance agent or consult the official web resources. And remember, this overview won’t apply to everyone, particularly if you are renewing a passport, applying without one of the parents or guardians present, or have other special circumstances.